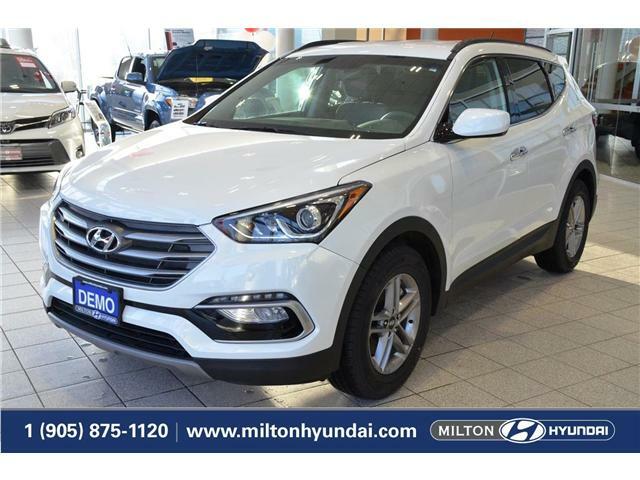 Welcome to Milton Hyundai, your Signature Certified Hyundai dealership in Milton, Ontario. We are presenting the new 2017 Hyundai Santa Fe Sport. You can find all the relevant information below. Enjoy! Get ready to take on your commute, early-morning hockey practice or that annual summer camping trip with the redesigned 2017 Santa Fe Sport. Beyond the dynamic styling, you will find versatile storage capability and an array of premium comfort features to exceed your every expectation. For added confidence, Santa Fe Sport is now available with a suite of innovative safety technologies like Autonomous Emergency Braking, Lane Departure Warning and Adaptive Cruise Control. Whether you choose the standard 2.4L Gasoline Direct Injection (GDI) engine or opt for the available 240 horsepower 2.0L twin-scroll turbocharged GDI engine, you will be ready to tackle your active lifestyle with ease. Sleek lines and powerful wheel arches drive the bold and dynamic profile of the redesigned 2017 Santa Fe Sport. The restyled front fascia features new advanced lighting technology, including available High Intensity Discharge headlights with an Adaptive Cornering System and the available High Beam Assist system. The sporty yet sophisticated appearance is grounded by available 19” alloy wheels. And as before, an available panoramic sunroof provides exceptional openness and bright ambience to the interior. Large alloy wheels perfectly complement the redesigned Santa Fe Sport’s sophisticated stance. Choose between the standard 17” or available 19” aluminum alloy wheels. The standard LED daytime running lights and fog lights help mitigate compromised visibility. Available twin-tipped, chrome exhaust pipes with a unique trapezoid design add a hint of European flair. Boasting sophisticated design and outstanding visibility, the 2017 Santa Fe Sport offers available LED tail lights. This available feature provides maximum convenience. It automatically opens the rear liftgate when you stand within three feet behind the vehicle, with the available proximity key, for more than three seconds. And unlike some vehicles, there is no need to kick or shuffle your feet to engage this feature. Plus, the handy height-adjustable function allows users to stop the liftgate at various heights to avoid low overhangs. The spacious interior of the 2017 Santa Fe Sport offers exceptional styling with an array of upscale amenities such as the standard rearview camera or the newly available Multi-view Camera System. But there is more to this stylish SUV than just providing a luxurious driving environment. The 2017 Santa Fe Sport is also designed to provide the luxury of versatility. For example, rear seating reclines for comfort, folds 40/20/40 delivering flexible storage, and is available with a second-row sliding feature – making it possible to bring a child seat closer the front passenger. The smart design also provides an additional 51L of storage under the cargo floor, so you can store items out of sight. Your sense of comfort and control is enhanced by a steering wheel that provides easy access to an array of standard features such as Bluetooth®, audio and cruise mounted controls, and tilt-and-telescopic functionality. You can also warm your hands at the touch of a button with the available heated steering wheel. An available panoramic sunroof spans over front and rear seat passengers for exceptional openness and luxury. Adapt to the cold weather with the standard driver and front passenger heated seats. And just in case your journeys take you somewhere warm, the 2017 Santa Fe Sport also offers available ventilated front seats. A standard 5.0” touch-screen display with rearview camera provides an intuitive interface for you to stream music from your smartphone or to talk to family and friends with the Bluetooth® hands-free phone system (8.0” touch-screen shown). Get multiple perspectives when you park with a split-screen view of the Santa Fe Sport. This advanced Multi-view Camera System includes an aerial view of the vehicle for a comprehensive look of the surrounding environment. The available Infinity® LOGIC 7® Surround Sound audio system has 550 watts with 12 speakers. There are also inputs that let you connect an iPod®, iPhone® or other music sources via USB auxiliary input jacks. Every 2017 Santa Fe Sport is equipped with standard rear privacy glass and features available rear-window sunshade blinds to provide rear passengers added relief from the sun's glare and increase cabin privacy. For added comfort, they can also enjoy the warmth of the available heated rear seats. An available integrated memory seat system will program seating and side-mirror settings for two profiles. Standard on all models with cloth seating, is a YES Essentials® seat fabric treatment that provides soil-resistant, anti-odor and anti-static properties for added longevity. Whether you choose the standard 2.4L Gasoline Direct Injection (GDI) engine or opt for the available 245 horsepower 2.0L twin-scroll turbocharged GDI engine, you'll be ready to take on your day in the redesigned Santa Fe Sport with power and confidence. The available active cornering control All-Wheel Drive system and 3,500 lbs of towing capacity provide even greater capability. All new for the 2017 Santa Fe Sport: an array of available driver assistance and situational awareness technologies to help keep you safe on your journeys. $26,700 x 24 Months @ 4.47% APR (estimated financing rate, cost of borrowing $1,234).